I’m a canned wine skeptic. Look at the craft beer industry where you have numerous benefits of using cans over bottles. Yet because of negative associations with cheap canned beers, craft brewers are still struggling to convince consumers. Why would wineries want to dip their toes in that fight? Especially when the wine industry still hasn’t embraced screw caps and boxed wines. Yes, wine consumers of the world are slowly coming around to those things but is it really a great idea to open up another battlefield theater against consumers’ perceptions? According to Nielsen data reported this summer sales of canned wine jumped last year from $6.4 million to $14.5 million with sales in 2016 expected to be even higher. I guess maybe I should start looking for some good canned wine to pair with my crow? One brand I could consider for that pairing is River Road Vineyards’ We Are California Chardonnay and red blend that I tried recently. The can kept the Chardonnay cold, crisp and refreshing with my tasting note including the word “delicious” more than a couple times. The red tasted different in the can as opposed to pouring it in the glass. In the glass, the wine was fruity with black cherry and floral pepper spice (like fresh pink peppercorns). I don’t know what the exact blend of this wine was but it reminded me of Pinot noir and Zinfandel. Sipping it straight from the can, I lost the floral and pepper spice though I still enjoyed the smoothness and dark fruit. But I want the whole package. I want the aromatics to go with the flavor and mouthfeel. For me, the marketing appeal of canned wines with their grab and go, toss in the backpack style is lost. I still need to find room in that backpack for glassware–just like I would for a bottle of wine or a box wine. So what’s the point? Yes, there have been times that we’ve all been the guy up the top. But usually that is only during emergencies or Thanksgiving. It’s not snobbishness. It’s about pleasure. The science is well known about how intimately connected our sense of smell and taste is. It is also well known how the exposure of oxygen (decanting or letting the wine “breath”) can positively impact the wine. You don’t need a fancy decanter or aerator for simple everyday drinking wine but even the small amount of agitation and aeration from pouring a wine into glass helps the wine open up a little more. Sipping a wine straight from a can doesn’t give me that. So, yes, I’m a still skeptic but I’m a reasonably open minded skeptic. I will try a canned wine from a high quality producer like River Road and, as I found with their We Are California cans, will admit when I’m pleasantly surprised at how delicious they are. Though I still don’t think that wineries have figured out how to market to folks like me. 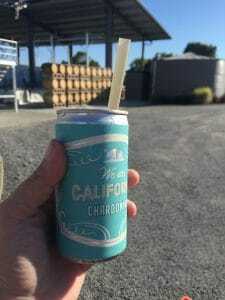 What is the real benefit for me to make wine in a can a regular purchase? Sure, there are certainly occasions (like camping, float trips, etc) where a canned wine is assuredly more convenient than lugging around a bottle or box wine. But, for those occasions, why don’t I just buy beer? Tagged Box wine, Canned wine, Craft beer, River Road.